Before I start my weekly recap, there is an issue I'd like to address. I am sure many of you have noticed the major increase of so called 'off topic' comments. People use USD comments section to advertise their sales, blogs, graphics; asking people to buy stuff from their wishlists, holding contests, and even having casual chat about non-Stardoll related topics. All of this has made USD a huge mess. I know you want to sell stuff, promote your doll, etc - but this should not be a place for these things. You have Stardoll.com, guestbooks, clubs, parties etc; you have other sites, forums, discussion boards, chatrooms. Plenty of other places. So until owner gets back and sorts this out, please refrain from posting any unnecessary stuff, and follow the so called 'rules', or guidelines that sdoreymenano posted here. Help us keep this blog's comments related to the topics. Thank you! Now, onto my recap. Honestly, as the week started, I was worried there would be nothing relevant to put in my recap. 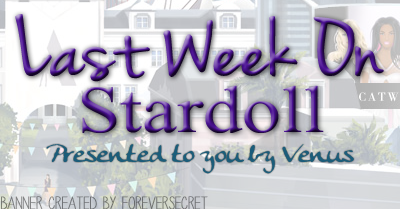 This has been one of the 'slowest' weeks on Stardoll. But at least you can all expect a new LE decor coming soon, so save your stardollars, if you buy LE decor, of course. Let me start my recap now. On Tuesday, Stardoll presented next 10 hotbuys for an upcoming month. Hotbuys seems okay to me. Quite good. I love the black shirt, jacket, skirt.. well most of the things. Except the gold top, it looks tacky. Also, this pink dress looks really cute on the doll, but I am worried how it would look like on my totally pale doll. Love how they used windblown hair on the pic, like the ones we got recently. Nothing much to say - we can only wait for the release so we can try them on. Hopefully they won't be too expensive. New Callie's Picks collection - must be another Wednesday! Actually, the collection is named 'Punk Princess"
As you can guess according to the title, the collection is a mix between punk and girl stuff. Of course, there are some rare items, like Frankie Morello bodysuit, yellow SATC dress, 2 hotbuy jackets, and a quite much Mortal Kiss stuff - I think there are 5 or 6. And again, I really dislike the way Stardoll put clothes together, and I am sure many other users could arrange them better. No offense. Also, a nice addition of windblown skirt to go with, again, the recent Windblown Tress Up collection we got. 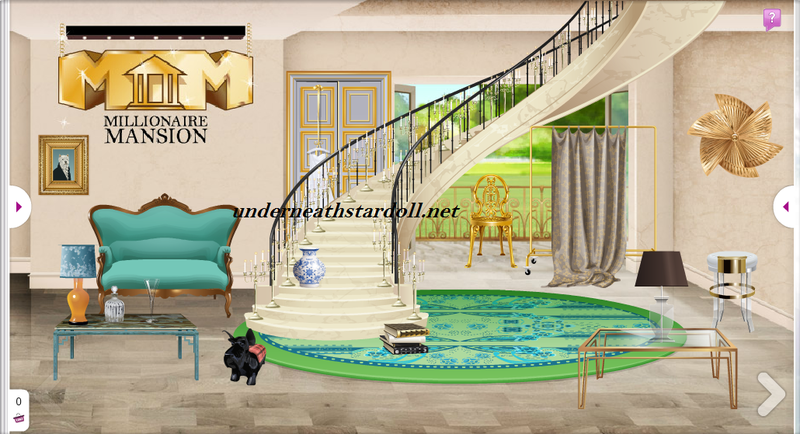 And the last big thing for this week, (yeah, last thing), the release of new interior collection to Millionaire Mansion store. The collection looks really luxury, with perfectly detailed furniture, and some really nice new items. I love the glass table, the piano, and a few other items. I really, really love it how they presented the collection, it looks flawless. (*Hint* Callie's Picks.) Prices are fair, and there are even some starcoin items. Seeing all those items makes me wish trying decorating my suite... Nah, who's got a time for that? Like I said, really boring week. But it is okay, you know. If Stardoll kept releasing lots of new collections, people would complain not having enough money to buy stuff. So an occasional 'slow down' seems right. Take a break, sell some unwanted stuff and collect stardollars. Of course, we always want more, so I am having my hopes up for a next week. Until then, vote on the poll, and see you in a week.